I read Nick’s article on the tennis courts at Wimbledon (for some reason he calls it a ‘bloggage’ – you can read it here). It made me think about my own sporting achievements which, if I am honest, were quite a few years ago. When I was at Primary School I was entered in the flat race at Sports Day, when I was aged 5. My mother had said she would be there watching me but I had not been able to see her in the crowd of parents. I lined up with the other children and the teacher started the race. I started running as fast as my chubby little legs would carry me and, wonder of wonders, I was leading. I so wanted Mother to see me winning so as I ran I started looking in the crowd for her. Because I was looking around as I was running I was not watching where I was going and I fell over, tripping up the rest of the children too. Gradually we all got to our feet and the more enterprising of us ran to the finish. I sat there wondering what had happened until my teacher came and collected me. (Mother had been there and saw the whole thing). On another occasion our Primary School engaged in a series of inter-school sports days with two other schools. I was not selected for anything in the first one and complained to my teacher. (I think they were worried I might look around for Mother again). My teacher tried to find something that I could participate in where I would not cause too much harm and noted that the tug of war team had not won anything. He put me in the tug of war team and I was thrilled to be able to wear one of our school’s gold-coloured sports t-shirts. 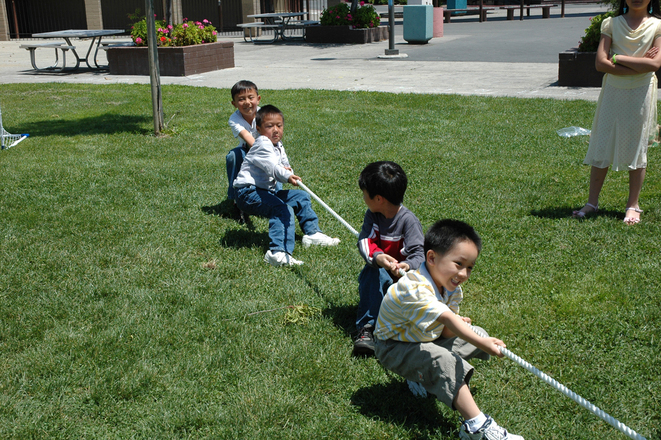 The next of the three sports days was at a school whose playing fields were on a significant slope and the tug of war was set up so that one team was pulling downhill and one was pulling uphill. In order to make it fair they tossed a coin each time to see which team would start off pulling downhill and we would swap places after each pull. I worked out that as it was ‘best of three’ it was definitely an advantage to start off pulling downhill. For some reason I was asked to call the coin toss each time and each time I called it correctly and chose to pull first downhill. Not surprisingly we won against both of the other schools (2-1 each time) but I didn’t care. I had won something as part of a school team! (As a post-script, the third sports day was at our school which had a flat playing field and our previously victorious tug of war team lost each pull). As I reflected on these two occasions I thought that the first reminded me that God is always watching me, even when I can’t sense him there, so my job is not to look for him but to run life’s race to the best of my ability. I thought that the second reminded me that regardless of my ability God chooses to use me in his team and that I should be proud of that. There will be circumstances I cannot control, but all he asks is that I do my best. Because his opening Devotions had been a reflection on England’s rather poor sporting performance in the European Football Championships I told Revd Phillip Inneck-Tucker (our Minister) about my sporting stories after the Church Meeting last night. He laughed and then he asked me to tell the stories in the first part of the service on Sunday, along with my reflections. Revd Phil gave me one of his funny looks and asked me to think about my reflections again. I don’t know what he’s getting at.